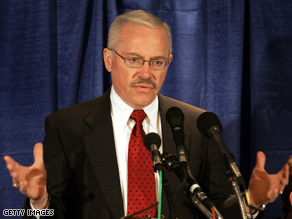 Bob Barr has clashed with his former party over policy. (CNN) - Former Republican Rep. Bob Barr is now the Libertarian Party's presidential nominee - and a potential headache for John McCain, as he reaches out to conservative voters who might otherwise vote for the GOP nominee in November. The former Georgia congressman - who left the Republican Party two years ago, citing differences over fiscal policy and concerns over civil liberties - was nominated on the sixth ballot at the party’s convention in Denver. The vote on the sixth ballot was 324 for Barr, and 276 for Mary Ruwart, the last remaining candidate out of 14 originally seeking the Libertarian nomination. We love jou Senator OBAMA!! So they went for this nut-job... it says a lot about Libertarians. If Obama doesn't choose Hillary Clinton as his runningmate Barr is going to be my choice for President. Make the right decision Obama, cause I'm not the only one who won't vote for you if Hillarys not on the ticket. Take votes away from McCain.. I like this guy! Can't wait for him to start spilling the beans on McCain and Bush. This is going to be interesting since so many conservatives may see this as a option to vote against McCain. When the Republicans lose, I can just see them use Bob Barr as an excuse for why they lost, instead of blaming their loss on their own failures. Just like they did with Ross Perot. Another BIG LIE....when is Billary gonna stop insulting our intelligence. After her latest blunder...during her apology she said she regrets making the remarks if anyone was offended. OFFENDED..hellz yeah i was OFFENDED and then to say that your remarks were made as a result of "thinking of the Kennedys these past few days" SPARE ME....that was a pathetic excuse...YOU MADE THAT REMARK NOT ONCE...BUT TWICE...before and got away with it by the mainstream media. I saw Keith Olberman's commentary on Friday and he said whatz been on most people's minds these days...at least the non zombies and politically educated few of us...who reserve our rights not to be brainwashed by the Hillary Campaign.. Where did I hear this same pathetic excuse before...oh yeah...after she dodged sniper fire. GET OUT! AND SAVE FACE!...SHAME ON YOU. cnn, I will be surprize if you post this . I just want to say that there is still a lot of people who do not like Obama because He is Black and His mother is White .Obama donot hate White people .I found out something. I have been living in this great country for 57 years . i am Black and born here.I never thought that so many White people would vote for a Black man to be president of the USA. There is a change in the peoples heart for sure. The whole world can see the change .No more judging by the color of skin. the world would be a better place. As a supporter Of Sen. McCain, I am not worried about Rep. Barr's entry into the presidential race. I believe that, as this election year continues, the American people will come to realize the historic candidacy of John McCain. Given the unpopularity of Pres. Bush and the Republican party, along with the novelty and excitement of Sen. Obama, the uniqueness of the McCain candidacy has been overlooked in the process. But by November, I am confident that more and more of my fellow Americans will come to see what I see: A man whose love for this country and service to it transcends self-interest, and who will bring an independence of partisan politics to our government and to our country. To the surprise of many, John McCain will turn out to be the American president Americans have been waiting for.